Recently I was on the Internet reading different blog posts from fellow Catholic bloggers, when I came upon a comment at the bottom of a blog post from someone who said they were a faithful Catholic, but didn’t have to believe everything that the Catholic Church teaches. My initial reaction was – What?! After composing myself, I took the time to pray for this individual in the hopes that they would come to realize their statement is completely false. The above statement is perplexing not just because someone wrote it, but unfortunately there are people in the Catholic Church that truly think they can pick and choose what they believe in and what they don’t believe in. Believing in the revealed Truths of Jesus Christ and His Catholic Church is not like picking out colors for the different rooms in your house nor it is like a choosing food in a cafeteria. In case you haven’t heard – the cafeteria is closed. We don’t need Catholics who are wishy-washy, Catholics who believe some doctrines, but the moral issues are out of bounds, Catholics who claim to be “social justice Catholics” but don’t adhere to the Social Teachings of the Church, and we don’t need lukewarm believers who come and go like the passing wind. In today’s culture, we need Catholics that are convicted in their faith; the same faith that Abraham displayed and was made perfect in the body of the Blessed Virgin Mary. 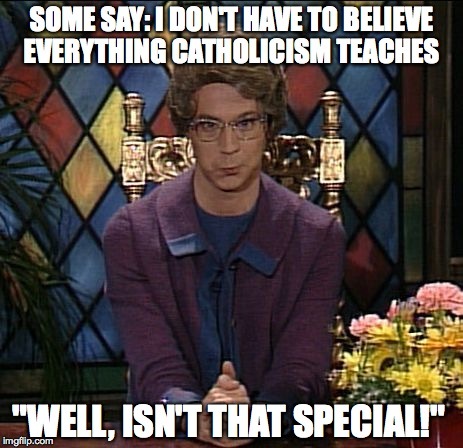 We need Catholics ready to believe in all the teachings of the Church, not just the ones they “feel” fit their lives. We need Catholics who desire to be Catholic – completely, wholeheartedly, and without exceptions. Although the Catholic Church has always been at war with the secular culture and the spiritual forces that support the culture, we find ourselves in a serious battle at this time in the overall war. The words of Fr. Henry should resound in our ears and prepare to us believe in all that the Catholic Church teaches and professes. Obedience is a key factor when it comes to faith. We need Catholics who are ready to be obedient and faithful. Faith is a personal adherence of the whole man to God who reveals himself. It involves an assent of the intellect and will to the self-revelation God has made through his deeds and words [#176]. “To believe” has thus a twofold reference: to the person, and to the truth: to the truth, by trust in the person who bears witness to it [#177]. We must believe in no one but God: the Father, the Son and the Holy Spirit [#178]. Faith is a supernatural gift from God. In order to believe, man needs the interior helps of the Holy Spirit [#179]. “Believing” is a human act, conscious and free, corresponding to the dignity of the human person [#180]. “Believing” is an ecclesial act. The Church’s faith precedes, engenders, supports and nourishes our faith. The Church is the mother of all believers. “No one can have God as Father who does not have the Church as Mother” (St. Cyprian, De unit. 6: PL 4, 519) [#181]. We believe all [italics mine] “that which is contained in the word of God, written or handed down, and which the Church proposes for belief as divinely revealed” (Paul VI, CPG § 20) [#182]. Faith is necessary for salvation. The Lord himself affirms: “He who believes and is baptized will be saved; but he who does not believe will be condemned” (Mk 16:16) [#183]. “Faith is a foretaste of the knowledge that will make us blessed in the life to come” (St. Thomas Aquinas. Comp. theol. 1, 2) [#184]. 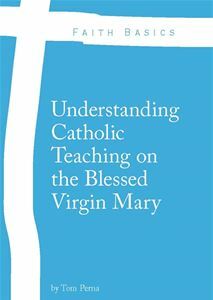 For a more extensive understanding of these points, I would suggest also reading paragraphs 144-175 in the Catechism. Dear Mr.PERNA, Your mentioning the term cafeteria Catholic. ,reminds me of what a young priest said on EWTN ,at about 4:30 In the morning. That cafeteria Catholic is just a another word for heretic!Given the time in the morning and the age of the priest ,this totally took me. a back! I wouldn’t go as far as saying that a cafeteria Catholic is a heretic, but they are someone who probably didn’t receive solid catechesis on what the Church actually teaches. People just need to be explained what and why the Church teaches. Heresy is a pretty strong word and there are people like that for sure in and outside of the Church.